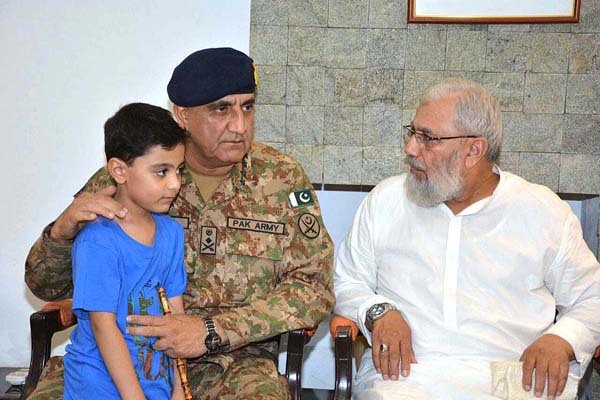 Bajwa and his wife visited family of Major Ali Salman here on Friday, who embraced “Shahadat” during an Intelligence Based Operation (IBO) at Timergara, Dir on August, 9. (ISPR), the COAS acknowledged the supreme sacrifice and said that shaheed Major Ali had made us all proud. cost. No threat can deter resolve of a nation which is united, resilient and honours its heroes”, the COAS said. his life enroute to operational area South Wazirstan in a road accident. The Commander Lahore Corps accompanied the COAS.